I’ve been asked by a friend to do some baby gift cards. Here are some baby girl cards I have started with … which one do you like best? The ‘It’s a Girl’ stamp I don’t like at all. As soon as I stamped it on this card I regretted it. The stamp is not a Stampin’ Up! stamp and, gosh, you can tell it is not! The quality is clearly lacking, so this stamp will be off to Ebay! I’ve used the Loves Me DSP for each of the above three cards and I really like this paper. It is only available in the Summer Mini Catalogue until the end of March and after that … it’s gone forever! I recently did an Artist Trading Card (ATC) swap with other Stampin’ Up! Demonstrators. This is the card I have submitted. The only condition for the swap was that we use the embossing technique. So how did I do it? I have embossed the prams from Simple Somethings with gold embossing powder and heated with my heat tool. I have also embossed in gold the edge of my Very Vanilla cardstock square. For the rest of the card I have used my Floral background stamp to stamp the Bashful Blue card strip. The ‘little one’ is from Nice & Narrow. The stripy paper is Four Seasons Designer Series Paper (DSP) and I have also used Old Olive and Pale Plum cardstock. The prams are coloured using my blender pens and SU chalks with the colours Bashful Blue, Old Olive and Pale Plum. And there are dimensionals everywhere! Finally, I have bordered the different cardstock with Chocolate Chip and three SU gold brads finish off my very first ATC. It is only tiny … 3.5 x 2.5 inches! I’m looking forward to seeing what I will get back. I’ll soon have 8 different ATC all using embossing to show off at my workshops and inspire me to create a full sized card!! The afternoon sun has distorted the colour of these cards slightly, so my apologies. If I waited until tomorrow morning to take the photos, I don’t think this post would go to air! These are a few cards I am sending to my hostesses holding workshops for me in the near future. I’ve been having fun with my ‘Simply Said’ Stampin’ Up! stamp set. Enjoy! I also used my trusty Spring Flowers punch for this card. 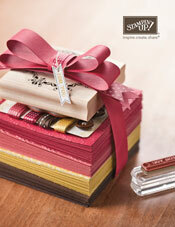 I added some of our Flirty ribbon here from the current Summer Mini Catalogue. These are two of the make and takes that we will be making at my Sale-A-Bration Launch party on Friday night (anytime from 7.30pm, 18th January 2008). Why not come along and make your own to take home? This first card doesn’t have to be a ‘thank you’ card. 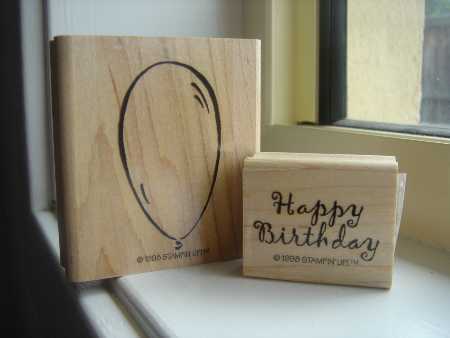 You can use any stamp from the ‘Warmest Regards’ stamp set to make your card your own. This card is gift tag size and would be cute and special to use as an ‘acceptance’ to a wedding you might be about to attend. Of course, it could be a wedding card too! We will be making one other card but it will be a surprise for the night. Why not come along and see what it is? Classes begin again – book in now! Bookings for classes are essential. The first class of the year begins at 7.30pm, Friday 8th February 2008 for Valentine’s Day. Please contact me no later than Wednesday 6th February 2008 to ensure your place. Looking forward to seeing you at my place! If you cannot make my classes, the why not organise a minimum of 4 people together (including yourself) and book me to visit your home for a personalised card making class. Contact me today to arrange a date! Would you make a Valentine’s Day card for your partner?